Sri Shah is an associate in our Nevada office. 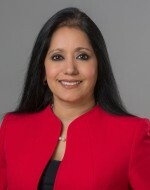 Born in India and raised in New York City, Ms. Shah obtained her undergraduate degree in Political Science from Queens College in Flushing, New York and attended law school at Pace University School of Law in White Plains, New York. Ms. Shah’s practice areas are construction defect and general liability litigation, including defense of contractors and subcontractors, manufacturers and suppliers, as well as design professionals, in commercial and residential litigation. Ms. Shah brings over fifteen years of litigation experience to our firm. Civil Litigation, including construction defect defense of contractors, subcontractors, designer professionals and suppliers and manufacturers in commercial and residential cases. Admitted to the Nevada Bar (1998); Admitted to Kansas Bar (1997); Admitted to California Bar (1992); Admitted to Illinois Bar (1991), Admitted to New Jersey Bar (1987); Admitted to New York Bar (1986). Member of Las Vegas Defense Lawyers.